Your ability to focus may be the one primary factor in your ability to reach a goal, complete a project, or just flat out succeed. An athlete like Mariano Rivera is an example of the possibilities of one’s talent to focus to bring a dream or dreams to fruition. Without an intense ability to focus, Rivera most likely would not have become one of baseball’s most dominant pitchers of this decade, and a marvel of post-season success that has enabled the New York Yankees to win multiple championships. The more I read about Rivera—and research what he does and how he does it—I don’t think that the majority of us could display the tenacity, mental toughness, and physical endurance that someone like Rivera does to reach the pinnacle of his sport. While growing up in Panama, Rivera substituted a stick for a baseball bat, and played with ragged, damaged baseballs. Then, as he got older, his father put him to work in a very physical job in his fishing business for 12 hours a day. Yup, this type of upbringing and driven focus makes Rivera a member of the old school, so my apologies to the young and ambitious of the new school. It’s not your fault, though. And there’s really not much you can do about it. There are far too many distractions in this world now to achieve that extreme sense of focus. When Rivera was a younger man in his native Panama, I’m sure was not much time spent on cable television, internet, cell phones, or texting. These modern “conveniences” of today are not conducive at all to the job of focus. The distractions that Rivera deals with—the rigors of travel, injuries, the constant lure of partying in New York City nightclubs—are minimal in number for him, and prove to be no match for his single minded intensity. He wants to win, more than he wants almost anything else. Focus for me? I’d like to think I could pay attention to the road when I’m driving, instead of looking to the side to see the turn of the autumn leaves, or that drawn out construction project on the main highway. I marvel at the fact some people can drive, talk, text, and eat a doughnut while applying makeup at the same time. I can be as distracted as anyone, and returning to any task after distraction is difficult, and time consuming. It is starting all over again. Write It Down! A training regimen of a Rivera, or an action plan for your business, does you no good unless it’s on paper. The most successful people in any line of work can tell you that a large goal (winning a World Series game) is accomplished by taking steps and completing subgoals (running, exercising, throwing every day). Don’t leave those steps to your memory…write them down to get them done. Visualize It! Once Rivera knew the impact his pitching prowess could have, he no doubt saw himself as a champion one day. The rest was just completing the steps to get him there. For those of us that aren’t pitchers, whether the goal is a six figure income, the trip of a lifetime, or an improvement on your home, you have to see it in your mind before it can become reality. Avoid Excessive Media I think this is a big one. How could I write this post, or concentrate on anything, if the TV’s on, I’m net surfing, or someone’s showing me the latest app on their new phone? Every commercial and show that you watch is so quickly edited, I can barely stand it. No wonder kids exposed to too much TV can’t pay attention. I’m so happy I grew up in an era where the camera was focused for longer than one second! Hold Yourself Accountable! And if that’s not enough, make others hold you accountable, too! Enlist a couple of friends if you have too. Rivera goes through the same stretching and warm up routine constantly—even when he’s not scheduled to pitch! He holds himself to a training standard that most athletes wouldn’t even touch, giving him a great advantage when he needs it most. You can also hold yourself to a higher standard in anything you do. I’d like to think that each blog post I publish will be to the best of my ability. And hopefully you, the reader, will hold me accountable! Take Persistent Action! Here’s where Rivera really seperates himself from his peers. No other pitcher of this era has his tunnel vision, his unsurpassed will to win. Even with the bases loaded and a full count standing up against him, he keeps his cool, keeps throwing his best pitches, never waning in the attempt to impose his will on the batter in front of him. Rivera avoided sure defeat in a couple of matches by continually pressing the action, always in constant motion, wearing his opponent down to record that final out. 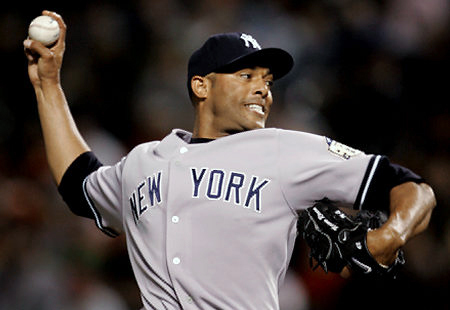 You, or me, may never be able to focus like Mariano Rivera. But we can always take action, be a little more relentless, and make things happen. Maintaining focus is the golden rule as far as I am concerned, in the pursuit of any achievement, sports, personal, or business.